The Kansanshi Mine owned and operated by First Quantum Minerals Limited is located roughly 15 km from the Solwezi Licences. The Kansanshi Mine is one of the world’s largest copper mines and also an important gold producer. As of 2012, the Kansanshi Mine updated Resource was estimated at 744.3 Mt @ 0.86% Cu and 0.15 ppm Au Measured and Indicated and 365.2 Mt @ 0.71% Cu and 0.12ppm Au Inferred. Existing infrastructure at the Kansanshi Mine complex includes a 1,200,000 tonne/year smelter and an SX/EW plant. The high grade 22 Zone is located 20 kilometers northwest of the Solwezi Dome and is less than 10 kilometers from the western mine gate of the Kansanshi Mine complex. 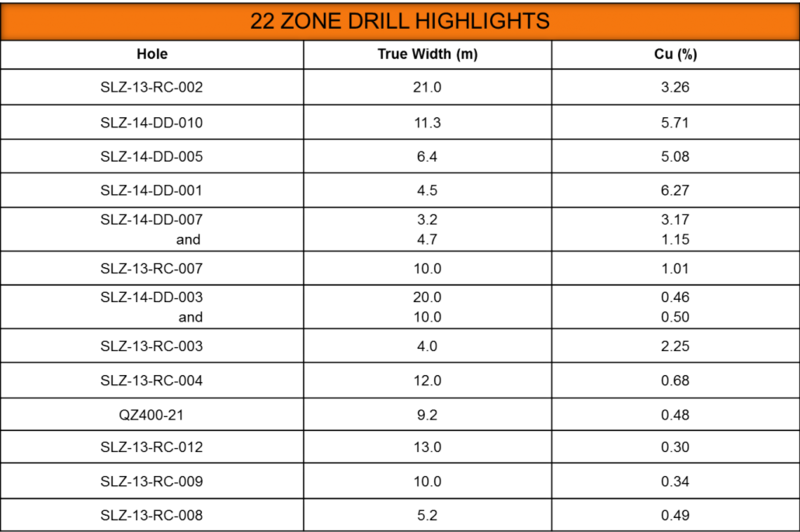 The 22 Zone was discovered by follow up shallow drilling in 2012 over a subtle copper anomaly and thick overburden. Drill campaigns in 2013 (reverse circulation) and 2014 (diamond drilling) extended the high grade, near surface discovery. Drill Hole SLZ-DD-14-010 at 22 Zone; 5.71% Cu over 14.2 (11.3 true) meters. In an attempt to detect the underlying source of the oxide mineralization at the 22 Zone, 6.7 kilometers of NSAMT geophysics was run in the vicinity, and a conductive zone was indicated. To date, this conductive zone has not been drill tested. It is currently thought that the 22 Zone and environs may be underlain by a basement dome similar to those at Kansanshi and Solwezi. This doming is believed to be intimately associated with the processes resulting in the copper mineralization at those sites. A deep drill test around the 22 Zone is planned to test for evidence of favourable lithology and stratigraphy once additional geophysics is carried out. 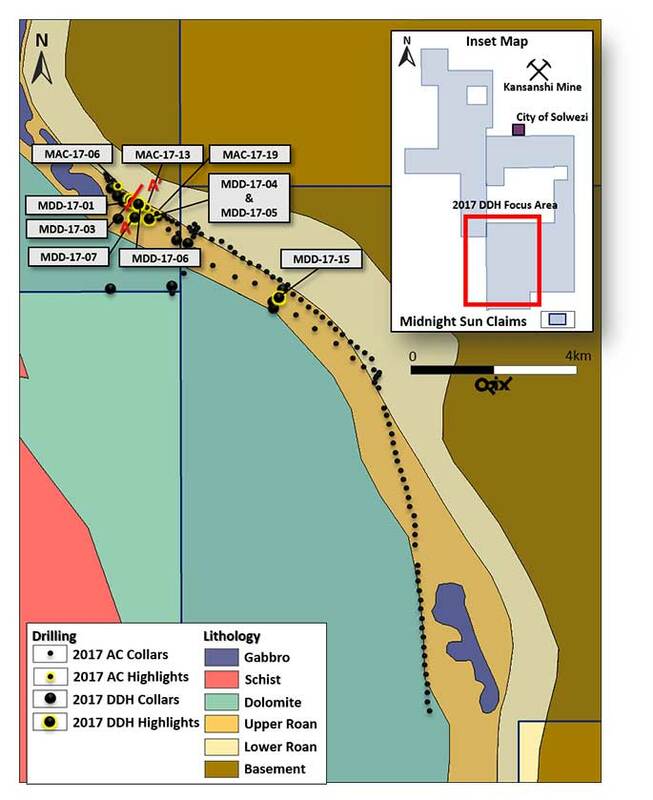 The Mitu area was targeted for drilling as a potential location of ore shale type base metal mineralization based on evidence from geochemical and geological surveys conducted by the Company and previous operators between 2010 and 2015. Ore shale mineralization is the dominant form of copper, cobalt and nickel deposition in the Zambia – Congo Copperbelt, the largest single copper production area in the world. Mineralization is associated with shale units which form chemical and physical “traps” for base metals at or near the favourable contact between the Upper and Lower Roan units. This contact zone along the western flank of the Solwezi Dome extends for over 17 kilometers on the Company’s License areas. 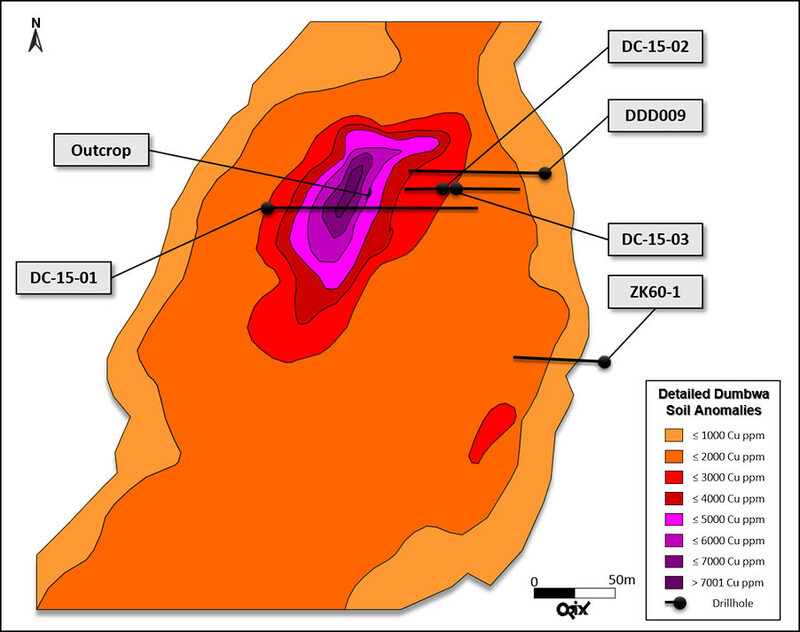 Diamond drilling has confirmed the association of copper, cobalt, and nickel with the carbonaceous shales, returning intercepts of up to 3.44% Cu over 11.4 m. Further exploration work is required to delineate the geometry of the sub-basin to successfully target the prospective carbonaceous shale unit. 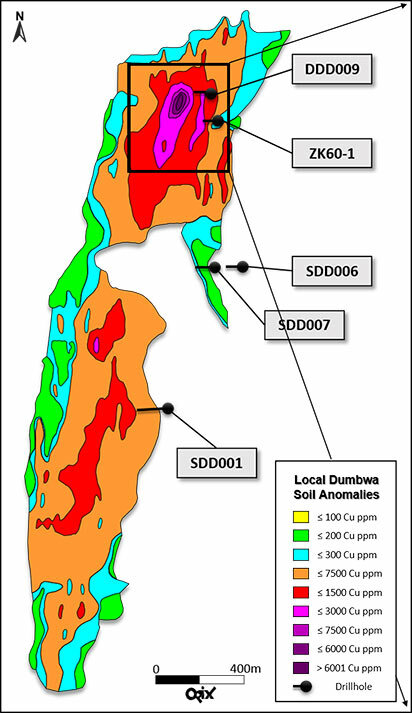 The copper soil anomaly at Dumbwa is one of the strongest on record in Zambia. 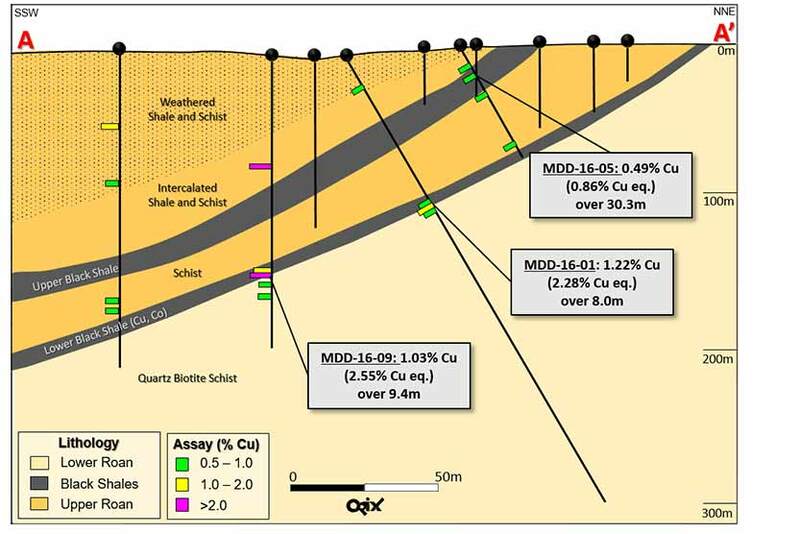 Successive campaigns of soil sampling and shallow Air Core drilling have tested some of its oxide copper potential and limited diamond drilling has returned some positive results. 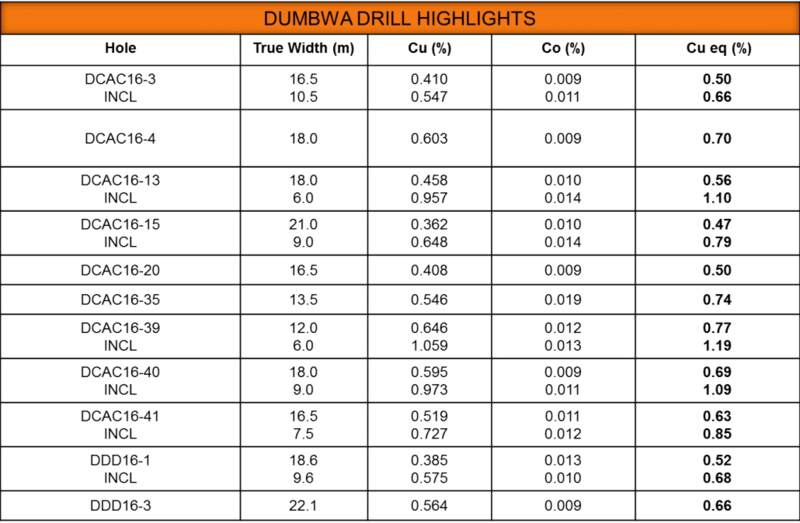 During 2015 and 2016, 50 air-core and 6 diamond drill holes were completed at Dumbwa. A strong north-south copper anomaly indicates a high degree of structural control and a possible fault zone potentially regional in size. The mineralized zone is estimated at 14 km long and roughly 150 – 300 m thick. 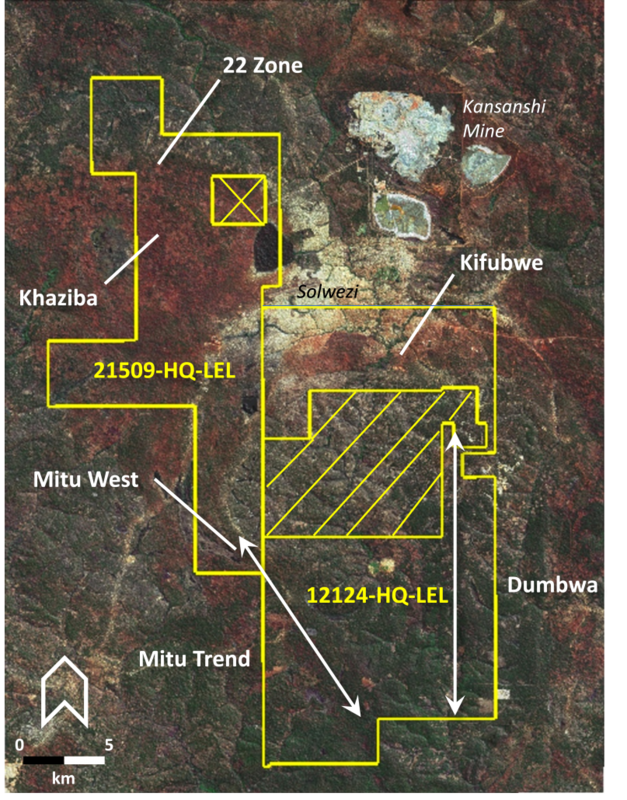 Based on the Company’s interpretation and past drill results, Dumbwa is a target worth pursuing at depth. 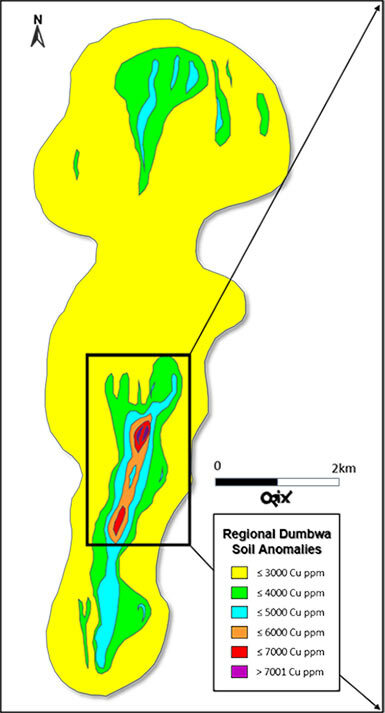 The Dumbwa mineralization is located within the highly folded and faulted Pre-Katanga Basement rock of the Solwezi Dome. The dominant lithology of the mineralized zone is fine to medium grained quartz biotite muscovite garnet “basement” gneisses that become schistose in localized areas. Surface mineralization is associated with intense potassic alteration of the basement gneisses. Mineralization appears to be structurally controlled and occurs as multiple zones of disseminated and veinlet hosted Cu of hydrothermal origin. 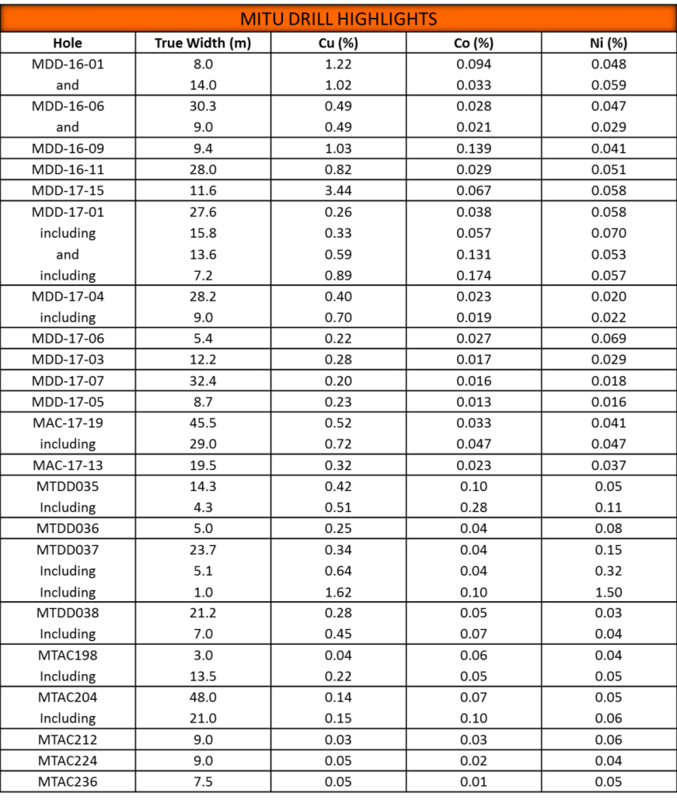 Cu mineralization occurs as malachite within the oxidized zone, and chalcopyrite, bornite and minor chalcocite within the sulphidized zone.